Now in Two Different Formats! Special discount if you buy the entire series! Need to lead singalong, but not a singer or accompanist? No need to worry. Simply download this series onto a cd or dvd, and play it for (or show it to) your residents! 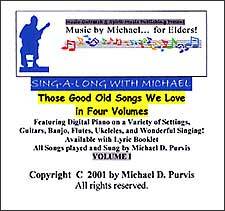 Your elders will glow and singalong as they enjoy Michael singing all the tunes they remember, while accompanying these delightful old songs on a variety of instruments. This series is designed especially for groups, but works great for individual elders, too. Whether its for a group or individual, if you want a singalong with no banter in between songs, that focuses expressly on the music, this is the series to choose. The audio version of this wonderful series is the perfect bedside companion for elders who are bedridden, hospitalized, shut-in, lonely, grieving, ill or depressed. Is nothing reaching or cheering some of your elders? Try this series! The video version of this lovely oldies singalong series works great for individuals or groups. It shows all the interesting instruments that Michael uses for accompaniment, and lets elders see this Michael who is their new musical friend. Use the audio and or video versions monthly, during various holidays... or anytime! Michael's warm delivery inspires and uplifts. Cheering banter between songs highlights the music, expands the themes, and gives this series a personal touch. Just download onto a cd or dvd, and you've got instant smiles! Music-Outreach Singalongs are unique, interactive, and contain beautiful singing. Elders will love hearing all the beloved old popular, folk, patriotic and gospel songs which they remember well... and Michael plays many different instruments as accompaniment. Each recording features digital piano on various instrument settings, several different types of guitars, and banjo. Your residents will smile and sing along as Michael draws them in and gets them involved with his warm, personal presentation! they feel like a live performance! Each volume contains a variety of beloved old songswhich you can use year-round!